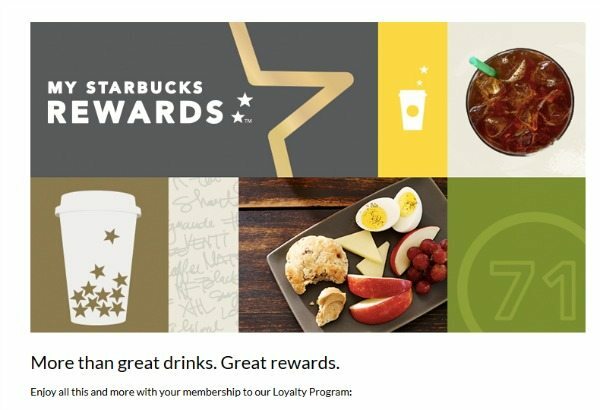 I predict that someday, sooner or later, Starbucks MyStarbucksRewards loyalty rewards program will give you stars based upon dollars spent, not “per transaction.” If I had to make a wild guess, I’d say it could happen within 12 months, but to be clear, that’s a wild guess. The current program gives one star each time your registered Starbucks card is swiped as a form of payment at the register. There are some exceptions: If you are purchasing at-home coffee at Starbucks, you earn one bonus star for each at home coffee item. If you are only using your card for a free refill (that is you didn’t pay for anything), you don’t earn any stars. So under t he current program, under most circumstances, one swipe of the card equals one star. Now and then, MyStarbucksRewards members may receive tailored promotions for bonus stars for specific items, but that’s an exception to the basic principle: one swipe of the card equals one star. Currently, once your Starbucks.com profile reaches Gold level, then every 12 transactions earns you a free food or beverage. Those rewards are valuable. Do you want lunch panini as a reward? No problem. It’s food or drink. The MyStarbucksRewards rewards can be used on almost all food and drink inside the store. However, you can’t buy beer and wine with the rewards, nor can you use them on the Starbucks Evenings category food. 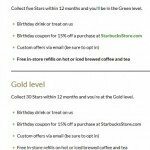 A MyStarbucksRewards member reaches gold level status by earning 30 stars within one year. Once you’re gold, you have to maintain that by earning 30 stars each year. It’s not a permanent gold status. One good question would be simply to ask, how much is a customer spending to earn that free reward? You might have heard it said that the average customer spends $5 per transaction. Higher numbers have been reported as well. In January this year, Eater.com reported that the average Starbucks customers spends $7.67 per transaction. When it comes out in the wash, after literally tens of millions of transactions per week, it’s easy to believe that on average customers spend at least $60 to reach a reward. Some spend much more! If he or she gets a $6 or $7 using the reward, he or she has been rewarded at the level of roughly 10% back. At $5 per transaction, that’s $60 spent to get a reward. If the average person is spending $7 per transaction, that’s a little over $80 to get a reward. Probably Starbucks expects that there will be many customers who use a reward valued between six and eight dollars. Once in a while, I’ve seen both customers and partners livid that one particular person got a very expensive drink, or divided up their purchase into multiple transactions. You cannot look at isolated transactions and make any statements about the health of MyStarbucksRewards. That kind of tunnel vision is not helpful. You have to look at the aggregate to understand this program. I promise you, if Starbucks thought that MyStarbucksRewards was a bad idea, they’d end it. It’s delusional to think that a sixteen billion dollar corporation hasn’t figured out how to take care of themselves. Once in a while, I’ve heard both customers and partners say, “They’ll never change MyStarbucksRewards.” We learn from history. The program has already been through many changes since rewards were introduced in 2008. We know that Starbucks constantly re-evaluates the program to make it more consistent with what customers are asking for and to keep it profitable and worthwhile for the corporation. What would a rewards program look like with MyStarbucksRewards stars per dollar spent? You’d probably have to spend between $60 and $80 to get a reward. March – April 2008: The first generation of MyStarbucksRewards were announced at the March 2008 Starbucks annual meeting of shareholders, and went into effect in April 2008. There were no levels. You registered a card, put money on it and you got free soy milk, free syrups, a free tall any coffee when buying whole bean coffee, and free refills. Here’s an April 2008 official Starbucks blog article on that first phase of rewards. 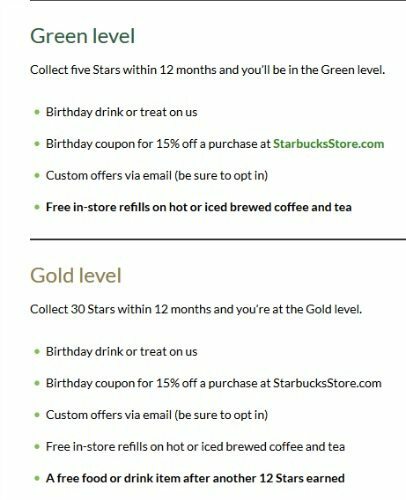 Before April 2008, there were no rewards at all at Starbucks. November 4, 2008: Starbucks offered a black gold card. This program was phased out in just one year. You paid a fee up front to get the black gold card and then earned 10% off each transaction at the register. For a while, there were two side-by-side rewards programs. A 10% off black gold card and the April 2008 version of the rewards program. Many people complained about having to pay a $25 membership fee. December 2009: By December 2009, MyStarbucksRewards went through a major overhaul. You earned stars per swipe of the card. The first levels (Welcome, Green, Gold) were introduced. And every 15 stars you earned a free drink (not food). This version of the program kept the free tall beverage with a pound of coffee, though now a Green level perk. By late December 2009, the earlier April 2008 version of the program had ended. October 2012: On October 16, 2012, a new version of MyStarbucksRewards went into effect. The number of stars needed to earn a free rewards dropped from 15 to 12. For the first time, you could use your reward on food. The free tall any-beverage with the purchase of a pound of coffee was axed – removed from being a perk. By October 2012, the only Green level perk was free refills in store (as it is now too). This was also the beginning of electronic rewards on the app or by the swipe of your card. Before October 2012, you got a paper postcard in the mail that you took to the store to redeem for your reward.The perk of free soy milk or syrups also came to an end with the October 2012 major overhaul. October 2013: Starbucks added additional food perks available as a reward. By October 2013, you could use your reward on just about any food item in the store. (Evenings food option were not included, and to this day are not included). March 2014: Starbucks added bonus stars for at-home coffee purchases, when purchasing whole bean coffee, Via Instant coffee, Verismo pods, or K-cups in a company-operated Starbucks location. For a long time, customers have asked for stars based upon dollars spent. If you go to MyStarbucksIdea.com and type in the search box anything like “stars” and “dollars” you’ll get tons and tons of ideas about stars per dollars spent. With 10,000,000 MyStarbucksRewards members, it all averages out. Starbucks could easily figure out how to do this. I know that there will be some people in the comments who complain that Starbucks can’t afford to do this. Trust me, Starbucks knows how to make a profit. And MSR members are valuable: they come back more often and spend more. There hasn’t been a major overhaul of the rewards since the big 2012 changes. It looks like traditionally, Starbucks announces major MyStarbucksRewards changes in the fall or winter season. Who knows? Your guess is as good as mine. I just don’t see any rational reason why it couldn’t happen. The Starbucks Pour Over: Guest article by Nick (a Starbucks partner). 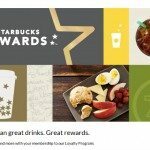 Launching 5-12-13: My Starbucks Rewards for grocery coffee purchases! I’ve been wanting this for SO long. As an employee, it’ll take me WAY longer to earn rewards but I think it will keep things the most fair. I have customers who spend $20+ most visits but would never, ever ask to do separate transactions to get ‘all their stars” – yet I have others who HAVE to have their two tall coffees on separate transactions or the woman who always “forgets” that she also needs a second drink. *swipe* oh, and oops maybe a banana loaf. *swipe*. Oh, actually two banana loaves. *swipe*. Haha I wish they would just tell me upfront. The downside to the star per dollar is that it slows down the rate at which drip coffee customers would see a return on their spending at Starbucks. I think that it makes sense as it is to keep the daily “tall drip w/ room” types linked into getting compensated for their loyalty to the company just as much as your caramel-crazed frappuccino crowd. I remember participating in a survey a while ball, via email, that was about the MSR program. They asked if you could design a new program how would you do it. And it was based on visits, transaction, dollar amounts, various rewards including percentage off after accumulating a certain amount of stars (low as 5). This is just the beginning. It was quite an extensive survey. I have a feeling your prediction is correct. Will be interesting to see the new one, if/when it happens. Another thing to note, Starbucks also expanded on the bonus star for at home purchases. The first time I bought the Tazo Passion tea bags from Starbucks.com, there was not a star. By November, the item was listed as offering one star just like the VIAs, and other coffee items. If Starbucks is choosing to expand on the items rather than limit them, it must be a valuable marketing tool in their opinion. count me as a ‘tall drip’ type w/ an occasional breakfast pastry and smoothie for the kid, who, every 12 purchases or so, treats myself to a venti mocha. there are many smaller coffee places i would love to try near my office, but i havent bothered since the msr program keeps me loyal. i know my type isnt as profitable to them (like a credit card user paying off my balance every month), but stars per dollar would likely end such loyalty. I hope they move in this direction. I too do not think that Starbucks would lose out if they did it. On another note- the other day when visiting our daughter I got a puppy latte for her dog. What a wonderful treat for her- she has become a rewards member too! SB has another audience to tap! This would be bad news for me. I am the Grande Dark Pour Over type of guy and like @gt said it would end my family members loyalty. Not mine really but I don’t think Starbucks should in a way penalize those who love their actuall coffee. Maybe another level would be much better. Like 50 Stars or 75 for a Platinum level or something. Imho i like the program as is. Though it may need certain adjustments. In the rest of the points world (think frequent flyer programs) the trend is in this direction – to tie spending with rewards rather than usage. Delta and United recently moved to systems where free trips are based on the amount of spending not the amount of miles flown. Southwest used to have a Starbucks-similar system which awarded a free round trip anywhere in the country after eight round trips – which is not sustainable when someone flies a short route like Seattle-San Francisco and then uses their free trip to go to Fort Lauderdale. Ultimately Starbucks may attempt a hybrid of the two. So 30 purchases would still be needed to qualify for gold, points are earned on a dollar basis (with multipliers during special events and for promoted products), and points might be redeemed for a qualifying free item of any cost – similar to the United MileagePlus program where you can qualify for elite status based on segments or miles flown. Coffee Bean is piloting a rewards program/app in the LA area, and their program is dollar based. $40 in spend gets you a free food/drink item of your choice. They also do special offers/coupons through the app that change monthly (i.e. $1.00 off iced coffee). What I like most about the Coffee Bean program is that they allow you to pay via any method you want and still earn the point per dollar. I was very loyal to Starbucks because of MSR, but since Coffee Bean launched this pilot about a year ago, I find myself going to whatever is more convenient and/or has the better version of the drink I’m craving. There are a lot of people selling stars on eBay. It will be interesting if Starbucks tries to dissuade people from doing this with a better rewards program. It’d make sense to me that they could create a platinum level of 75 or so to dissuade customers from selling stars because once you’re gold, what’s the point of having more? For my reward I only spend $24.00, 12 Tall bold coffee’s. For my reward I redeem for a Venti Frappuccino. So I get almost 25% back. I have been a very loyal starbucks customer since I joined the msr. I used to go to starbucks once or twice a month, now I plan my meetings at a nearby starbucks, or la boulange. It may not change my habits, but all my friends and family would most likely switch to a more local or different coffee experience. A dollar rewards program would no longer be a worthwhile benefit. I do hope for a platinum level of 75 or 100 stars. Hmm, interesting. Basing stars on a dollar amount seems more fair than doing it per transaction, especially for those who spend over $10 per visit. And I like the idea of rewarding people who have earned over 60+ stars with a platinum level. I mean, I’m close to re-upping my gold status until 2017, so after that, it just won’t be as fun trying to collect stars. Why not both? Either X purchases or $Y will net you a treat. Might have to do a little tweaking (there’ll clearly be some folks who’ll treat this as an optimization problem), but this way both the drip coffee crowd and the frappuccino folks will be satisfied. How about a star per item, that evens out for the folks who get tall drip vs. Frappuccino. Also saves on the ringing up separately. I haven’t had a chance to respond to these comments – so many good thoughts. @CaseyKay – One problem with stars per item is that MSR includes all the stars earned at both Evolution Fresh and Teavana. There are over 600 Teavana stores – and the price point for Teavana purchases depends to be much much higher than the average Starbucks ticket. I think that since MSR envelops 2 other brands with higher average tickets, stars per dollar amount makes some sense. Though, as I mentioned my article, I made some guesswork. Who knows? Maybe it will go to stars per item, regardless of the price point of that item. I didn’t know I was supposed to feel bad when I ask to split my transactions. I’m pretty sure I’m never going to feel bad doing that. I used to get a tall iced green tea 12 (or 15) times but I’ve done it for so many years that I’m now sick of it. I get an iced green tea latte and let that be that. While I would like starbucks to make the change, I doubt they will. Yes, the program has gone through quite a few iterations, 1 feature hasn’t really changed: 1 point per transaction. Melody, you are absolutely correct. My average purchase at starbucks is about $8.50, average at teavana is about $18, and my average at la boulange is about $20. I would still prefer the simple one star per transaction.as would many others. I know I would personally not benefit from $ amount spent, but that is because I get a partner discount. I love that is is per swipe as I can receive a star for a food item or other small ticket item. I tend to purchase a beverage and other smaller items when I come to read/study. While sitting there, having a rewards card makes me more apt to throw on an additional item like a bag of popcorn or pastry. I would be one of those that would benefit from going by dollar amounts. I rarely buy just one coffee…if I stop on the way to work I buy myself and my assistant one, it’s my card that gets used when my husband and I get coffee after work, and it’s not unusual for us to stop at a Starbucks to grab coffee and breakfast when we head out of town on weekends. I spend a lot at each visit and only getting the one star just doesn’t seem fair. I know that if I did separate transactions I could get more stars, I just don’t feel right doing that at this point. I remember when I had the black gold card along with the Starbucks Duetto Visa / stored value card. I don’t remember paying the $25 fee for the gold card; I think they just sent it to me because of the Visa card. Between the 10% off and the Starbucks Visa loading credit card spending rewards directly going onto the Starbucks debit card half, I rarely had to pay at Starbucks. On top of this, they would sometimes load a quarterly reward onto the card too. Ahhh, those were the days. I wish they brought back one card that combined all three features. The highest margin item is on the drip coffee. The amount of labor and materials that goes into that is the lowest in relation to its sale price. So while the tall drip guys pay the least, they also pay the most for the least value. I hope they keep it as-is. I spend about $3/star on average and would not be happy to see a switch to $ based rewards unless it were in that zone, say $35-40 (or less!). I do split my transactions since most of the time I’m sitting and working at a Starbucks, but I do that by getting one item at a time over the course of my visit. If I’m on the go, I will sometimes split my items to get the separate stars, but never if there’s a line. I tend to get 25-30 stars a month, more with promos. I agree with Melody that if Starbucks were losing money, they’d change it pronto, but I know I stop more and buy more because of the rewards program (the kids chuckle over the star game). I would be less inclined to keep up that level of activity if my overall transaction cost increased due to the program switching to a $60-80 per reward level.